The School Prom over the last few years has become the pinnacle of the school social calendar. There is always more demand for limousines on prom dates than there are stretch limo's to go around. Don't leave it too late to book your choice of prom limo for the BIG arrival at your prom venue. Limousines of Cheshire offer a choice of prom transport ranging from stretch limo's to the latest helicopters and Ferrari supercars. Dare to be different? Our stunning chauffeur driven 8 seat limousines will arrive at your pickup address gleaming and ready for the all important photos. For added X-Factor, we use red carpets with all our limousines on arrival at your prom venue. 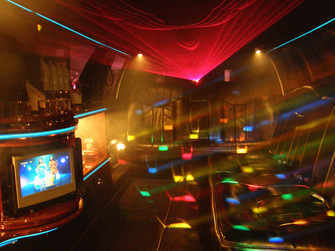 We offer an hour limo prom cruise on to your venue with the return journey at the end of the night if needed. Your uniformed chauffeur will serve you a chilled bottle of non alcoholic bubbly and a range of complementary soft drinks are available in the bar - Coke, Water and Lemonade. Also mints and marshmallows are included for you to enjoy. All limo's have big CD/DVD sound systems with all the latest tunes or you can provide your own music cd's if you prefer. . Add in the amazing Laser light and disco show to ensure the perfect start to your evening. Hire your prom limo in Cheshire with confidence - All our stretched limousines are fully licenced and regulated by Cheshire West Council and undergo 6 monthly safety checks. Your limo chauffeur is also licenced with Cheshire West Council and has had full disclosure C.R.B checks and full medical. 5th July 2013 - Rudyard Hotel to Consall Hall and Gardens, Staffordshire. I would just like to say Thank You for the limousine that we hired for the school prom last night. The girls say that they had a great time and the chauffeur was wonderful. I am pleased to say that I would recommend you to others and I have appreciated your helpfulness during our communications. Well done for providing an excellent service.